Naturally, there is a lot of jewelry worn by the royals in the Netflix series about the life of Queen Elizabeth II, The Crown. 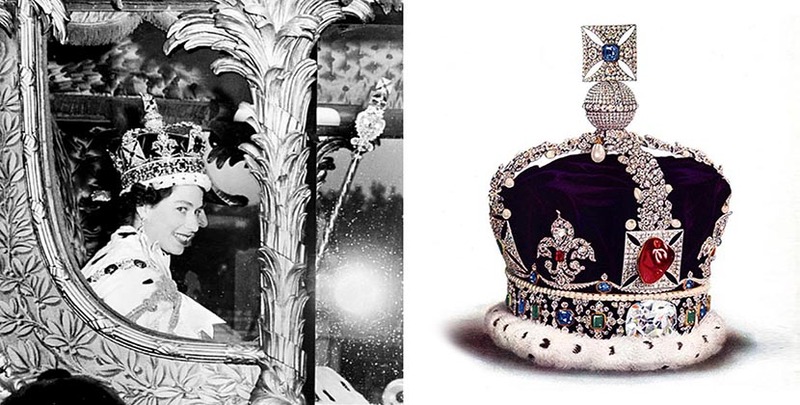 The jewelry star of the show, however, is the Imperial State Crown of England. Featured dramatically in the opening credits of every episode, it is at once a physical symbol and a metaphor of the British monarchy. In anticipation of season 2 which starts streaming December 8, I have taken a closer look at the history, incredible gems and symbolism of the jewel. There has been an Imperial State Crown of England since the 15th century. Inspired by historic examples, the current rendition was created in 1937 by the British jeweler Garrard for the coronation of Queen Elizabeth’s father King George. It has four fleur-de-lis, symbols of the monarchy. Four cross pattées, representing Christianity and the church, accent the sides. Arches in oak leaf patterns crisscross the top. A mondé—a jeweled ball representing the world— with a cross pattée acts as a finial. 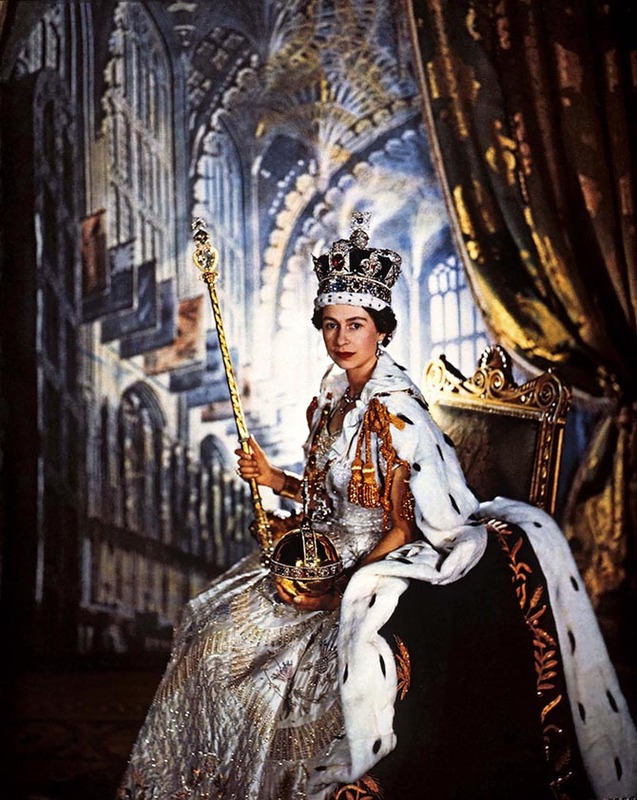 The piece was altered slightly for Queen Elizabeth’s coronation in 1953. 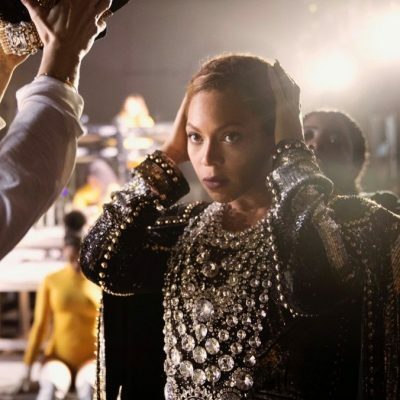 To make the design more feminine, the arches were lowered by about 1-inch and, of course, it was sized for her head. 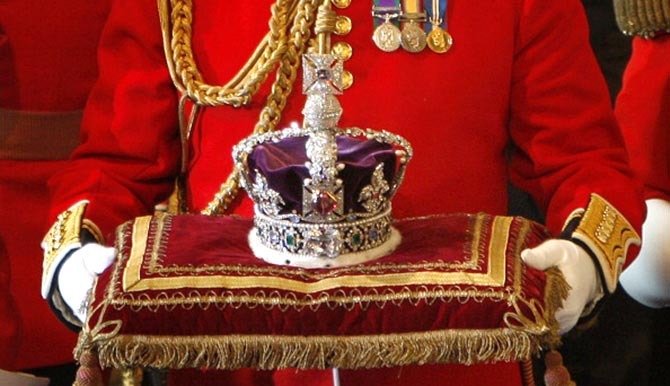 The Imperial State Crown is just over one foot tall and weighs 2.3 pounds. It is composed of a platinum elements and a gold frame set with 2,868 diamonds in silver mounts. 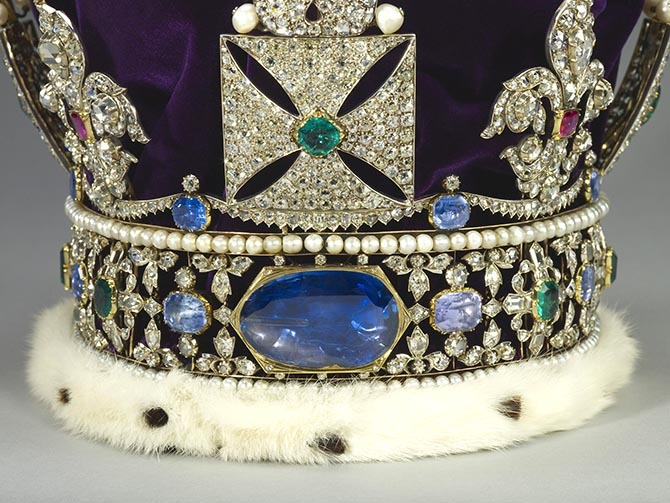 The colored stones on the crown are in gold mountings and include 17 sapphires, 11 emeralds and 269 pearls. Ermine trims the bottom of the design. A purple velvet cap is in the center. The three most important gems are detailed below. The Queen’s favorite gem in the crown is the Black Prince Ruby. The extraordinary stone, set in the cross pattée on the front, is the largest uncut spinel in the world weighing in at 170-carats. It is also one of the oldest gems in royal collection. The gem was named before at a time when all red stones were called rubies. They were divided into categories based on their chemical composition at the end of the eighteenth century. The original owner of the spinel, Edward of Woodstock (1330-1376) was known as the Black Prince. He was the eldest son of King Edward III, but died before his father and never became king. At one point the Black Prince Ruby was pierced and worn as a pendant. Later, a cabochon ruby in a gold mounting was used to fill the hole. On the back of the Imperial State Crown is the 104-carat oval shape Stuart Sapphire. The gem received its name when it was owned by James Francis Edward Stuart, the Prince of Wales (1688-1766). It was on the front of Queen Victoria’s Imperial State Crown. The stone was moved to the back when the monarchy acquired the Cullinan II. 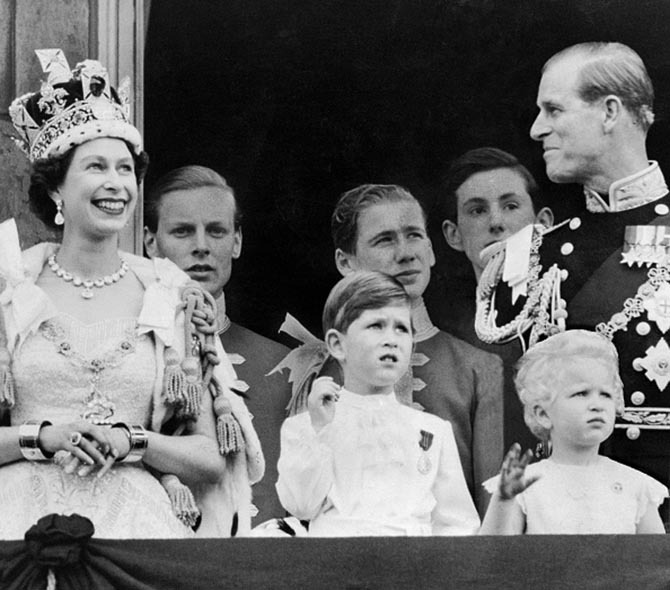 In preparation for her coronation and to become accustomed to the weight, Elizabeth II practiced wearing the Imperial State Crown throughout the course of her day. 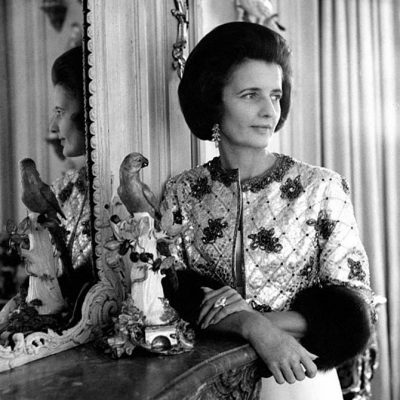 According to Arthur Bosfield author of Fifty Years of the Queen (2002), she wore it at her desk, at tea and while reading the newspaper. 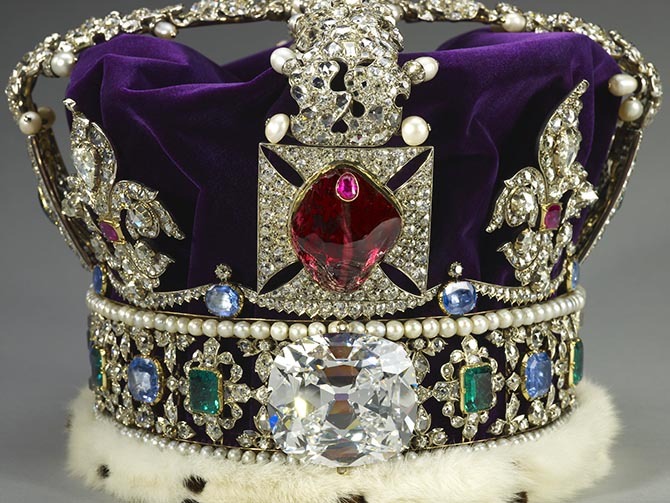 The Imperial State Crown is kept on display at the Tower of London with other jewels from the crown collection. 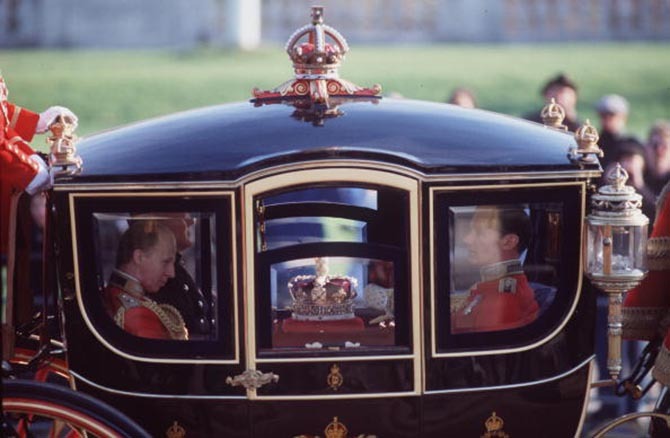 The crown is taken by carriage to the Palace of Westminster for the opening of Parliament. According to the BBC, during World War II it was kept in a biscuit tin and buried below a secret exit at Windsor Castle to protect it from being theft from the Nazis. The Queen wears the Imperial State Crown during the opening of parliament when she delivers her speech. 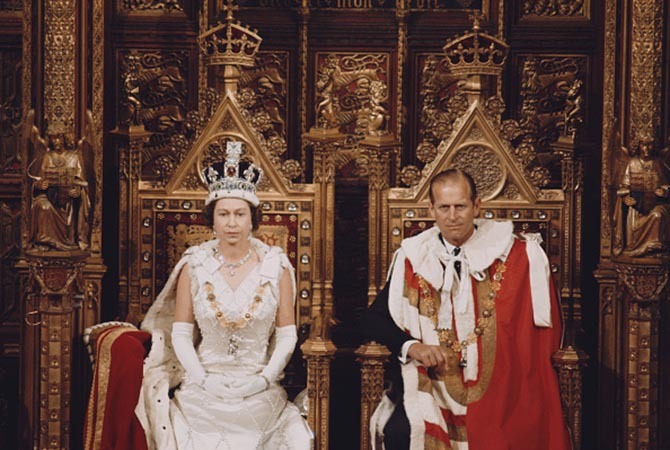 When there has been snap elections in England as there was this year and in 1974, the queen has worn a hat and civilian attire, as opposed to the coronation robe. The crown was placed on a cushion to her right. 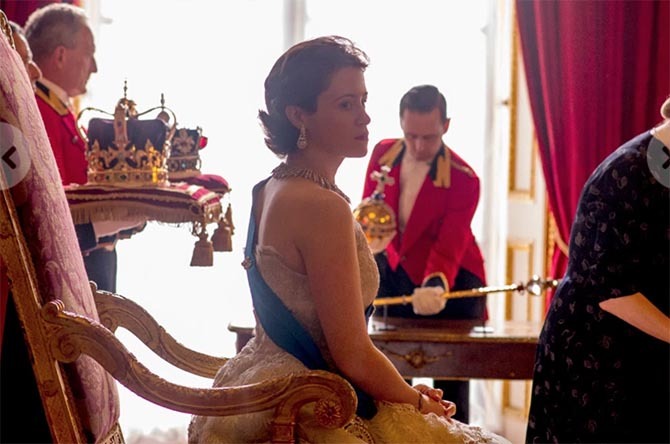 In the dramatic final scene of the last episode of The Crown Season 1, Claire Foy who portrays the queen was surrounded by the symbols of the monarchy for an official photograph including the Imperial State Crown, Edward’s Crown, the orb and sceptre. The jewels brilliantly symbolized the pressures of the monarch’s responsibilities that override everything else in her life.